The Organization and Management section of your business plan summarizes the information about your business' organizational structure, business members' duties and expertise, as well as their education or qualifications. While business plan outlines vary, often this section comes after the market analysis. This section is especially important if you have a partnership or a multi-member limited liability company (LLC). However, even in a single-person business, it doesn't hurt to summarize how your business is organized and will run. Because it highlights the skills and experience you and your organization has in the industry, it can be a great resource to refer to when seeking publicity and marketing opportunities. It can be easy to forget an award or a certificate, but if it's listed in the management section of your business plan, you can refer to it when doing your media kit or pitching for publicity. With that said, if you are starting a home business or are writing a business plan for one that's already operating and you are the only person involved in the business, this section isn't needed if you've already discussed your background earlier in the business plan. Within these sections, you have specific areas to cover about how your business is structured and who's involved. 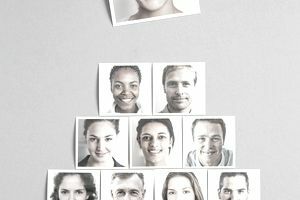 The organization section sets up the hierarchy of the people involved in your business. It's often set up in a chart form. If you have a partnership or multi-member LLC, this is where you indicate who is president or CEO, the CFO, director of marketing, and any other roles you have in your business. If you're a single-person home business, this becomes easy as you're the only one on the chart. While technically, this part of the plan is about owner members, if you plan to outsource work or hire a virtual assistant, you can include them as well. For example, you might have a freelance web master, marketing assistant, and copywriter. You might even have a virtual assistant whose job it is to work with your other freelancers. These people aren't owners, but have significant duties in your business. This section highlights what you and the others involved in the running of your business brings to the table. This not only includes owners and managers, but also your board of directors (if you have one) and support professionals. Start by indicating your business structure (i.e. partnership or LLC). A board of directors is another part of your management team. If you don't have a board of directors, you don't need this information. But even a one-person business could benefit from a small group of other businesses owners who might be willing to provide you with the feedback, support and accountability that comes from an advisory board. This section provides much of the same information as in the ownership and management team sub-section. Background information such as education or certificates. Anything else that makes them stand out as quality professionals to have helping you in your business such as awards. Writing a business plan seems like an overwhelming activity, especially if you're starting a small, one-person business. But writing a business plan can be fairly simple and straightforward. The point of this section is to be clear to yourself, and those who work with you or for you, or will be funding you, who's involved and in charge of what, as well as the background and skills that will be contributing to the success of the business. Like other parts of the business plan, this is a section you'll want to update if you have team member changes, or if you and your team members receive any additional training, awards or other accolades that benefit the business.